Nick Heath's riproaring short journey through the escapades and intrigues of the French anarchist exile community in London's Fitzrovia in the late 1800's. The area in London bounded by Oxford Street to the south, Great Portland Street to the west, Euston Road to the north, and Tottenham Court Road to the east, was dubbed the London’s Old Latin Quarter by E. Beresford Chancellor and later Fitzrovia by the Labour MP Tom Driberg. It has has a long history of radicalism with waves of French and German revolutionaries arriving after 1848 and then with the clampdown by Bismarck in Germany and the defeat of the Paris Commune. Swiss and Italian immigrants also added to the radical mix in the area. The Fitzroy Tavern, home of Augustus John and then Dylan Thomas, originally had the very Germanic title of The Hundred Marks. Much has been written already on the Free School set up by Louise Michel and other anarchists in Fitzroy School, not to mention the Communist Club in St Stephen’s Mews and the Autonomie Club in at first Fitzroy Street and then Windmill Street. This article instead focusses on other establishments used by French anarchists in the area which were components of a vibrant network of meeting places, of foci of discussion and activity and of mutual aid and support. At 67 Charlotte Street stands the three story building where Victor Richard, a refugee from the Paris Commune, who originally hailed from Burgundy, had his grocer shop the Bel Epicier. The anarchist Charles Malato in his De La Commune A L’Anarchie (From the Commune to Anarchy) remembered Richard as “the most jovial, the most smiling of grocers. Yes a grocer, but he is so little that! All the refugees came there because he expressed, without sectarianism, the most crimson opinions”. Victor Richard had been a grocer in Paris when he was caught up in the events of the Paris Commune and he had fought heroically on the barricades. He was a close friend of Zéphyrin Camélinat who had also fought on the Commune barricades up to the last moment. Victor Richard was then in his fifties. His grocer shop appears to have been a roaring success. He stocked wines from Anjou “sparkling and non-sparkling”, cornichons and mustards from his native Burgundy, and one account alleges that his coffee mill popularised the contraption in Britain as well as the French way of making coffee (as in later decades Emidio Recchioni’s King Bomba shop in Old Compton Street introduced many British people to continental gastronomic delights- perhaps someone should write an article on the anarchist contribution to good eating and drinking!). He only stocked red beans and not the “reactionary” white ones! Monsieur Richard was a loyal friend of another Communard, Jules Vallès, who penned a fine novel on the Commune, Jacques Vingtras: L’Insurgé, and of the radical journalist and feminist Séverine (Catherine Rémy) who was always sympathetic to anarchism. Indeed she thought so highly of him that she dedicated one of her articles to him. The great French revolutionary songwriter Eugène Pottier, author of The Internationale, was another who dedicated one of his songs Les Affameurs (The Starvers) to the benevolent grocer. For the “generous Burgundian” was always willing to extend credit to revolutionary exiles and much of the money he made was spent on the cause in one way or another, including funds on at least one occasion for French revolutionaries hounded in Britain to enable them to leave the country. Victor Richard was also a good friend of that icon of Italian anarchism, Errico Malatesta. "Is M. Richard here?" I asked the phlegmatic René, his trusted assistant. René examined me with a nuance of suspicion: from the fact that, if enemies of the State came into the shop, informers did too, French naturally. The chief of these was Inspector Houillier, who stole the name of Johnson, correspondent for Le Figaro, and asked for the names of exiles to render them a service. “He is still in bed- the sybarite! But if you would like to wait just half an hour”. I risked asking the address of Louise Michel. The suspicions returned: René looked at me as if I wanted to force open the till. I named myself, he found that I was not unknown to him, the ice is broken. When the grocery store was raided by the police in 1894, a list of phrases useful to French exiles in London were discovered. This may refer to Malato’s little work, The Pleasantries of Exile, where in addition to ferry time-tables between England and France, a number of helpful phrases are included. Here are some of them. With the attentats of Vaillant, Ravachol and Emile Henry in France, surveillance from the French state on the exiles in London increased. The afore-mentioned Inspector Prosper-Isidore Houillier of the Sûreté, with his assistant Fedeé secretly arrived arrived in London, with the connivance of Inspector Melville of Special Branch. “Le vil Melville“ (the vile Melville) as he was known to the exiles was a sworn enemy of anarchism and he was once again breaking the rules in allowing the French cops to operate in London. Houillier seems to have spent a lot of his time eating at the best London restaurants, apparently all at the French public’s expense. 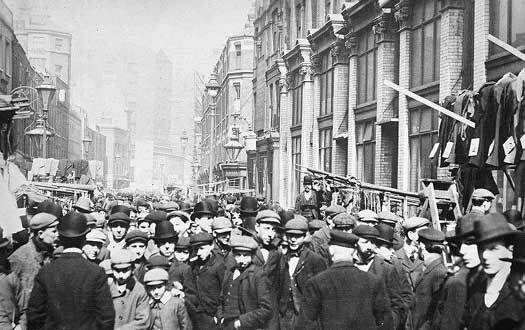 On the track of the anarchist Meunier, the cops were given a tip-off that he was holed up at 30 Charlotte Street. On arriving there they were surrounded by a large crowd of anarchists, and serenaded with revolutionary songs accompanied by the barrel-organ played by the colourful anarchist Zo d’Axa. Uniformed police had to be sent in to get the cops out of the sticky situation. On another occasion Houillier and his SB pals followed removals vans around London that they had mistakenly linked to anarchist fugitives. On yet another occasion Houillier tried to pass himself off as an anarchist but was recognised by the comrades, who decided to lead him a merry dance. He was in search of the anarchist Mathieu, suspected of the crimes later accredited to Ravachol and Meunier. Day after day they promised that Houillier would meet Mathieu, day after day there was always an excuse, and day after day Houillier treated the comrades to food and drink, to the value of sixty francs a day. Finally, Houillier was lured to a pub on Great Portland Street full of French anarchists. Asking once more for Mathieu, he was told that he couldn’t come because he was getting his hair cut. The penny now dropped and Houillier became conscious of the crowd in the pub all staring at him. Some had taken out large clubs which they were leaning on. He turned pale. After a heavy silence, M…, a Parisian anarchist, raised his pint of bitter and proposed a toast “To the French police, so well represented here today by our excellent friend Houillier, by our old chum Houillier!” The anarchists lined up to shake his hand whilst M.. continued “Something tells me that he has leave England very soon, and we must give up all hope of seeing him again. He should know that we will always guard a memory of his good manners and excellent meals that we will never relinquish. Hurrah for comrade Houillier!” Houillier was finally allowed to leave the pub after many more sarcastic toasts. The humiliation was not over for him, however. The following morning, arriving at Charing Cross to take the train to Folkestone, he was welcomed by a large crowd of anarchists, who helped him with his luggage and accompanied him to his compartment. There they lavished him with advice that he could have expected from his mother, warning him against cold draughts and other hazards of the journey. M.. implored him: “At least promise us that you will write to us”! As the train set off, the anarchists following it along the platform waving their hats and handkerchiefs and crying out “Vive Houillier!”. Another centre of the anarchist community in Fitzrovia was the book and newspaper shop run by the anarchist Armand Lapie at 30 Goodge Street. Armand Denis Célestin Lapie, to give him his full name, was born at Saint Ermes on 26th April 1865. His father was the Blanquist Alcindor Lapie, who had blown himself up in his bomb factory during the siege of Paris by the Prussians in 1870. The director of the anarchist paper Père Peinard, he fled to London after being sentenced in 1892. His shop became the main meeting point of French anarchists in the capital including Ernest Delebeque, François Duprat, Jules Corti and Pétronille Altérant. Cohen describes how sometimes even, fights broke out in the shop over these differences. As the narrowness of the shop only allowed for two people at a time, they at first thought of continuing the quarrel outside. However, on second thoughts, the aggrieved parties realized that they risked harassment and arrest by the police on the pavement and were forced to calm down. Like all exile communities, the French and Italian anarchists in London had their share of dissensions and bitter feuds as described by Cohen. They had the further misfortune of having a sizeable number of illegalists and individualists among them, not least the dubious character Luigi Parmeggiani. This group was totally opposed to what they called the “associationists” (anarchist communists) and in particular to Malatesta’s advocacy of effective organisation. Parmeggiani used proceeds from his expropriations1 to line his own pockets, buying an antiques shop for himself. He built up the individualist group La Libera Iniziativa which was favourable to “Ravacholism”. Meeting at the Autonomie Club, this group denounced Victor Richard and other “associationists”. Worse, Parmeggiani accused Lapie of being an informer at the end of 1895 and his group put up a series of posters around the area publishing these accusations. As a result of these accusations, Lapie was eventually forced to leave London for Switzerland where he remained active as an anarchist. There were suspicions among the “associationists” that Parmegianni was himself a provocateur (never corroborated from Italian police records) and it was certainly the behaviour of him and his associates that decided Malatesta and others that any work was in the future impossible with the anti-organisationalists. Parmeggiani dropped anarchism completely at the end of the 1890s, though he remained involved in illegal activity, like faking expensive antiques and acting as an international receiver of stolen antiques. The above-mentioned Ernest Delebecque lived at 28-30 Fitzroy Street with his wife and six children. Originally from Lille, he had had to flee France in the 1890s. He worked as a cabinet-maker and rented rooms to incoming French comrades. There was a regular weekly meeting on Sundays at his place, attended by Emile Pouget, Lapie, François Duprat, Clovis Sicard , as well as the Italians Malatesta and Santo Magrini. And for Delbecque and his female companion, there was a long series of persecutions of all sorts. The man was continually shadowed by police agents … and risked losing every job. The woman, who nursed a five-month-old kid at the time, became the target of the most odious plots: as soon as they knew she was alone, the investigators would wrangle their way into her house, passing on false news about her husband, sowing anxiety, trying to extort some compromising confession out of her through intimidation, forcefully offering this deal: tranquillity at the price of informing. And since the woman maintained her silence in dignity or raised her voice to hurl her contempt in the face of her tormentors, they turned it into a brutal, ongoing obsession. The mother’s health didn’t hold up against the moral tortures and her milk could no longer nourish the baby girl—causing her to die in slow agony. The foul Melville used the same tactics at another time with the English anarchist Charles Mowbray and his French wife Mary. It was fun writing this article and I hope you have just as much fun reading it! Great read.. definitely had a lot of fun reading it.. especially the bit about the undercover French policeman! Yeah, this was great, thanks! Comedy, tragedy a bit of everything!